Motorola may now hold the title of first company to put out a working 5G phone, but its main market is still low-end smartphones, and leaked renders of the Motorola P40 Play illuminate this. The renders, from reliable Twitter leaker OnLeaks for Compareraja, show the front and back of the rumored device, and it looks a lot more like a low-end phone than we'd previously heard. What is Android One anyway? The front of the device shows a screen broken up by a 'teardrop' bezel, with a rather wide chin below the display, and on the back of the handset we see a dual-lens rear camera, a high-up fingerprint sensor, and speaker perforations at the bottom. Although it's hard to see, there's a micro USB port at the bottom of the frame, and a 3.5mm headphone jack at the top. According to the leaker, the screen will be 5.6 inches, while the dimensions of the phone are supposedly 147.7 x 71.5 x 9.2mm, and the rear cameras will take 13MP pictures, although that doesn't confirm the actual specifications of the device. Several of the features shown make the P40 Play seem quite the low-budget phone, including the micro USB port, relatively weak rear camera and thick chin, which is indicative of a cheaper handset – but that makes sense, given the P40 Play is likely the 'lite' P40 device. What about the other Moto P40 phones? If the P40s are anything like the P30s, there will be three phones – the main P40, a larger P40 Note, and this P40 Play. We've heard the flagship P40 will have a 'punch-hole' front-facing camera and will run Android One, so perhaps it will be marketed outside China as the Motorola One Vision, an upcoming Android One device the company is rumored to be working on, as the P30 was marketed as the Motorola One in some regions. 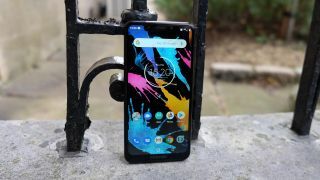 Check back to TechRadar for all the latest news, reviews and rumors on Motorola's phones, as well as all other smartphones and more.